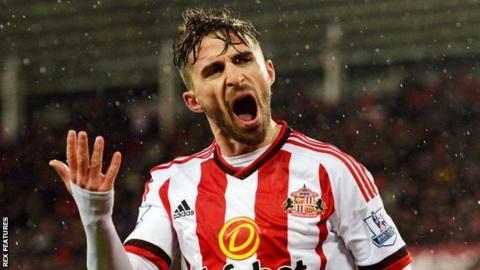 Swansea City are interested in re-signing Sunderland's Fabio Borini - but the Swans insist Andre Ayew will not be moving in the opposite direction. Sunderland have had a bid of £14m for Ayew, 26, rejected and they are thought to be considering Borini, 24, in any fresh offer. But Swansea coach Alan Curtis says there is no chance of a swap deal. "Fabio would be one of a number of players whose name has been mentioned," said Curtis. "But the talk of Andre going there as some sort of part of the deal is wide of the mark. "I spoke to the chairman [Huw Jenkins] just to clarify the situation and he assures me that there is no way that Andre will be allowed to leave during this window. "On that basis, whether Fabio was part of a deal involving Andre I don't know, but certainly Andre is out of the deal." Borini scored six goals in nine Championship appearances for Swansea during his loan spell from Chelsea in 2011, helping them win promotion to the Premier League. The Italian has since played for Parma, Roma and Liverpool, leaving the Anfield club to join Sunderland permanently last summer. Ghana captain Ayew joined Swansea on a free transfer in June 2015 after his contract at Marseille had expired. He has scored seven goals in 22 appearances for the Swans, including a goal in the 4-2 loss to Sunderland at the Liberty Stadium earlier in January. Only bottom side Aston Villa have scored fewer Premier League goals than Swansea this season and, with that in mind, Curtis has previously stated signing a striker is a priority for the Swans. But asked about a potential bid for Blackburn forward Jordan Rhodes, Curtis said: "I don't think Jordan's name has been mentioned." Following Jonjo Shelvey's £12m move to Newcastle, Swansea are also thought to be looking for midfield recruits. They enquired about the possibility of re-signing midfielder Joe Allen from Liverpool - but the Reds dismissed the approach. "There was no concrete offer. I think we've sounded out the availability of so many players," added Curtis. "Joe would be one of a number of names the club will have considered." Curtis was in sole charge of the team on Monday as Swansea beat Watford 1-0, but the 61-year-old has handed over control to new head coach Francesco Guidolin. The Italian watched the Swans' win against Watford from the Liberty Stadium directors' box and will take charge of his first game at Everton on Sunday. "He's settling in OK. He addressed the players on Wednesday and spoke really warmly, really passionately about what he expects from the players and what he will give to them," said Curtis. "It was really impressive, considering he's got a limited amount of English. "I think he's very thoughtful - probably shades of [former Swansea manager] Michael Laudrup in many ways. "He's quite reserved, he is very thoughtful and very measured in what he speaks but you feel there is a little bit of a fiery temper there as well."